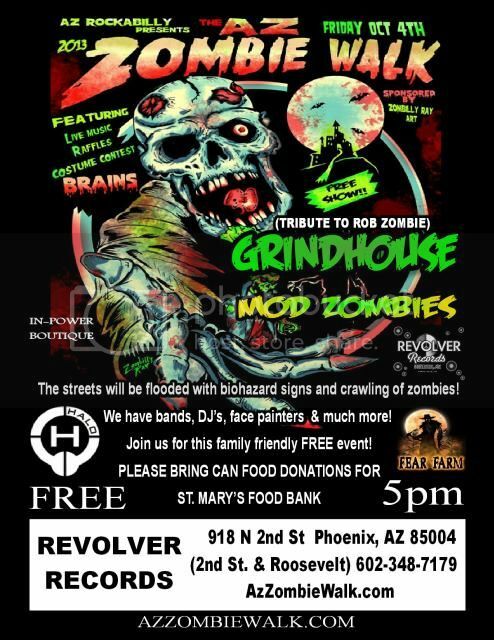 Join us in our 4th annual Az Zombie Walk, Downtown Phoenix Art district at Revolver Records, 2st. and Roosevelt. Event is happening on Friday, Oct.5 from 5pm – 11ish pm. This a grass root effort to help raise canned food for St. Mary Food Bank. Bring Attention and Business to Phoenix Downtown Art District. Please take avantage of all the Art Gallaries, Arts/Crafts/Food Vendors and Street Performers. The Zombie Walk starts after the last band performs. Its starts at Revolver Records Records on 2st and Roosevelts continues to 7st and Roosevelt and then we return back to Revolver Records.